Today, I spent a few hours at a community day where I used to live. My task whilst there was to help collect and sort books that the community were donating in order to create an ‘honesty library’. The rules for the honesty library are that the public can come along and take what books they fancy reading, then bring them back when they’ve finished. They can also donate their own books in exchange for what they fancy on the shelves. So all in all a good idea, especially in a deprived area which has seen cuts to it’s library service. I’d like to think that as well as promoting reading and literacy, it will also help strengthen the community with more people passing through the centre and building bonds with each other. I was a bit slow in putting the books out as I had to look through nearly every book, check the publication date and give a bit of a running commentary on what I’d found! And then when I did actually manage to put books on the tables, I kept ruining the order and display that my best friend had put so much time into! Well, it has to be said there were a few good finds in the couple hundred books we sorted through today. My best friend only went and got her hands on a copy of this! 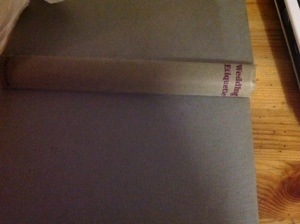 Wedding Etiquette by Mary Woodman. The great thing about the internet is that we can find the information we require so quickly and from what I gather this book was published in 1949. So I’ve had a quick browse through it and all I can say is oh how times have changed. Or have they? My initial reaction is to smirk at some of the things written in it. You may think different. Let me regal you with a few! Before the contents page is a page titled ‘Morals for the Married’, well straight away I’m in doubt of if I should go any further! The last ‘moral’ on this page is, ‘…Don’t imagine that your point of view is the only one…’ Hahahaha! Straight away I see I’m in trouble! So I started reading further and got to page 35 (yes I was engrossed) and read the following ‘…When it is the man who feels it incumbent on him to break off the engagement, he should give the girl every opportunity of taking the lead, … This is suggested because the world looks a certain amount of disfavour on a girl who is turned adrift by her lover; but it has very little, if indeed any disdain for a man who is placed in a similar predicament. It is, thus, a last favour which the man can bestow on the girl whom he has ceased to love…’ Oh. Alright then. I thank you kindly for letting me dump you. I think? Believe it or not I kept on reading. I was intrigued to see what else I’d find. I loved what I found on page 48. ‘…Once the whole party has reached home, or the hall appointed for the reception, the bride’s parents welcome the guests, who say complimentary things to the newly married couple, and inspect the presents, if they are spread out…’ Inspect the presents. INSPECT THE PRESENTS!!! I love this little snip bit of wedding etiquette! Wouldn’t it be great if you could just go around the reception hall, inspecting the presents like you were walking around a department store, except, you’d know who bought what! Can you imagine the ructions that would ensue! So I only read up to page 51 and this is what it had to tell me with regards to speeches, ‘…The bride may elect to say something quite short and brief; but, as a rule, she contents herself by smiling an approval of her husbands words…’ What’s that? Start as you mean to go on? Head in my hands man!!!! To conclude my little trip down memory lane, I have learnt that according to the rules of six decades ago, I am not married because I don’t know when to keep my mouth shut, I don’t know my place and I struggle to back down! Great, I will just run along and continue with my life … In the same vein!